Connect to windows server at the TU/e using Mac OS X | Christoph Bartneck, Ph.D. The Department of Industrial Design at the Eindhoven University of Technology offers two servers to its staff and students. The so called “S Drive” is a shared drive to which many people can share access rights. The “G Drive” is your personal server on which you can place your website, but also any other documents you would like to have backed up. In case that you are working from outside the TU/e, you need to first connect to the TU/e network using a VPN. 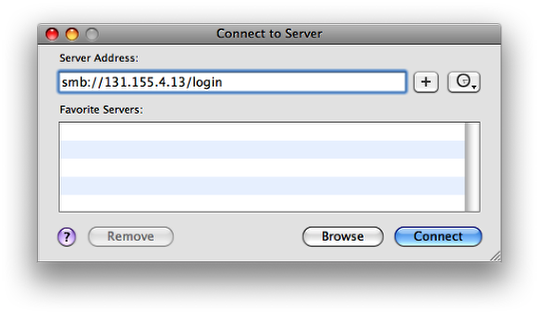 Add the server address and the login information. In case of your G Drive, this will be your windows login name. In case of the S Drive, this will be “common”. For students, the IP address is “131.155.4.72” for their G Drive. 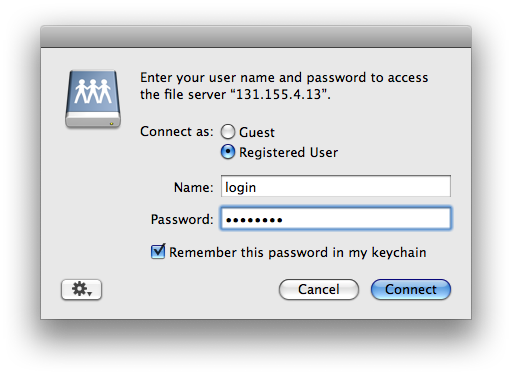 For the S Drive, the students have to use the IP address show in the picture, but use “idstudent$” for the login. Add your windows login and password. If you check the box “Remember this password in my keychain”, you will not have to re-enter the password at a later point in time. You can use an easy Apple Script to mount the G:Drive and the S:Drive. Use the Apple Script Editor to edit the scripts and save them as applications. Please replace your userName and password with your personal data. Then you only have to drag&drop them into the “startup items” in your System Preferences>User Accounts. You can also use the smb line in your “connect to server” dialoge. Christoph, a million and one thank yous! I used command-k from Finder to get to the first dialog box. * Go to Places -> Connect to server..
* Click next to “Add Bookmark” and enter the name that you’d like to give the folder under “Bookmark Name:”. * Click “Connect”. Enter “tue” for the domain and enter your password. I’ve tested this on the latest version of Ubuntu, 10.04 Lucid Lynx. important note: use ‘TUE\yoursnumber’ as login. everything else will not work. I can only access my G drive by connect to server. the apple script doesnt seem to do a lot. Do you know how to access the w drive as well? I am following your walkthrough to connect at the g drive of tue but i take this message.. could you plz help me? (send me at my email plz! There was an error connecting to the server “131.155.4.13”. Check the server name or IP address, and then try again. If you are unable to resolve the problem contact your system administrator. I have the same problem as Nick ad would greatly appreciate some help to resolve it. Thanks.